The public service mission of the SHFJ is ensured by the Nuclear Medicine Service which carries out scintigraphic examinations in two sectors, the conventional nuclear medicine sector (single-photon emission tomography or TEMP) and the positron emission tomography (PET) sector.  The Nuclear Medicine Service is a central service of the Nord-Essonne Healthcare Cooperation Group (GCS), including Orsay, Longjumeau and Juvisy hospitals. Its activity is based on a partnership with the CEA. The department carries out nuclear medicine activities for diagnostic and therapeutic purposes for the hospital group as well as for medical professionals throughout the entire life area. sentinel node search in breast cancer. The metabolic therapeutic activity concerns the ambulatory treatment of hyperthyroidism by iodine-131. in neurology, in the diagnosis of neurodegenerative pathologies and for the pre-surgical assessment of epilepsy in children and adults. To get to the Service Hospitalier Frédéric Joliot, instructions here. Appointments for an examination are made by the medical secretary of the SHFJ, upon patient's request. For a particular examination (myocardial, brain), a written invitation is sent to the accompanied by an explanatory note explaining the procedure for the examination. The deadline is about one week, except for urgent cases where it can be reduced to one day, sometimes the same day. Some examinations are taken preferentially on a particular day of the week, for example myocardial scintigraphy. The SHFJ welcomes all patients including infants (under 6 years). All requests for scintigraphic examinations are verified and validated by a nuclear physician, who agrees or disagrees about the examination. The opening time of the reception runs from 7.30 am to 5 pm non-stop, Monday to Friday, 48 weeks a year (three weeks in August and one week between Christmas and the New Year's Day). At the end of the examination, a report is drawn up by a nuclear physician of the SHFJ. The final report is faxed to the prescribing physician within a maximum of two days. The final report is also sent by post, along with a hard copy of the images (representing the most significant cuts for the examination). The tariffs applied comply with the social security nomenclature. Rates are communicated at the request of patients.